eatdinner.org: Can Family Dinner "Trend" in 2012? Can Family Dinner "Trend" in 2012? The year started off right as family dinner was cited by The Hartman Group as a leading trend for 2012. I am all for "rediscovering" family meals as a simple but powerful step toward better health and wellness. It is what I truly believe in and advocate for everyday. Yet, I have to think: How can we make "family dinner" a real trend, not just an empty marketing slogan? First, let's keep it real and inspire and support families to make this commitment to family meals, not just set up more guilt or blame for busy families. Just start where you are and resolve to make it work for your family, even if you have to start with super-small steps. Time at the Table has a family dinner pledge you can take and just once a week is a starting point! With that in mind, I am proud to join with Blog for Family Dinner as we encourage families to recommit to family meals in the new year. B4FD will be posting articles all month to inspire you and give advice about how to make family meals a meaningful, and manageable, and part of your life. Spirit Magazine (the in-flight magazine of SouthWest airline) has a great article, Tell Me Something, with lots of fun tips and advice on starting the new year out right, including a long quote from me about the benefits of family dinner. Scroll down for section: Is there a Simple Way to Keep My Family Happy and Healthy? 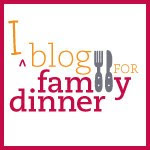 Please share any posts or ideas about recommitting to family dinner in the new year in the comment section or on the Facebook pages for EatDinner.org or Blog for Family Dinner. We are creating a broad community to chat about these issues and would love to hear your voice. Happy New Year and here's to a happy and healthy 2012 with a "family dinner" at every table! The Power of Parents in "Changing the Way We Eat"